The first ART WRITING FIELD STATION took place at Five Years Gallery on 7 Feb 2010 2-4pm. It featured presentations from David Berridge, COMPULSIVE HOLDING (Hyun Jin Cho and David Johnson), Tamarin Norwood and Matthew MacKissack. Marianne Holm Hansen responded to the presentations and discussion, creating a lexicon of Art Writing as part of her FOR THE RECORD (A Written Conversation) project. Histories of experimental poetics and writing are often related to practices and metaphors of “the field” – from Charles Olson’s “open field” poetics to engagements with anthropological field trips and field notes as models for situational and performative writing. 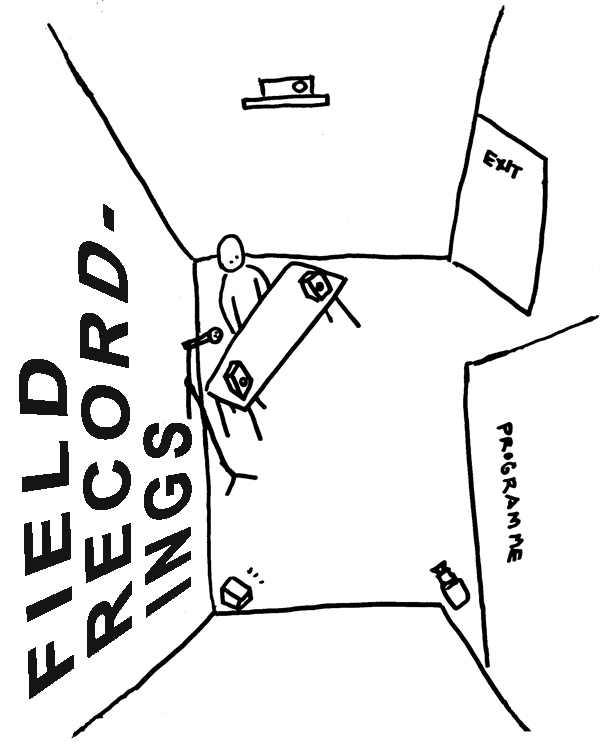 The aim of this discussion for FIELD RECORDINGS is to try and explore how such ideas can inform current writing practices by offering an event that models the idea of ” a writer in the field” and also offers a “field recording” of such practices in poetic operation. ART WRITING FIELD STATION began as a fictionalising of my work as a writer interested in connections between writing and contemporary arts practice. I gathered together a variety of texts from different virtual and physical locations (galleries, bookstores, events, websites) that together constitute part of the ever shifting “field” of my writing practice. I find conceiving of this practice as “field” helps foreground such texts not as finished, consumable products but as active EVIDENCE and MATERIAL, something malleable to be worked with, examined, taken apart, noted, and annotated, and also part of a broader cultural (eco-) system. I invited COMPULSIVE HOLDING, Matthew MacKisack and Tamarin Norwood to present their own response to this theme of “field.” The precise structure and nature of this event has unfolded from discussions between us. Each of us will present for 20 minutes. Marianne Holm Hansen will compile from all of our talks a lexicon of words and phrases. This “field” of words and emotions will be seen as the field that has emerged from the bringing together of our individual practices within this event at the FIVE YEARS gallery. The final part of our event will be an open discussion of this emergent field. Each of the presentations will be published by VSK in March as a 20 page e-book. The second ART WRITING FIELD STATION will take place in Leeds on March 27th, with presentations from David Berridge, Rachel Lois Clapham, Emma Cocker, and Mary Paterson. Please email verysmallkitchen@gmail.com if you would like to attend.